Harland Sanders founder of Kentucky Fried Chicken started his franchise business at the age of 65! That is retirement! Harland Sanders founder of Kentucky Fried Chicken started his franchise business at the age of 65! That is retirement! Who would have thought that someone could venture out doing something so magnificent at that age? I am sure he was hesistant about this dream. But he did it anyway, and you know what? It became a huge success many, many years after he’s gone. We also name others like John Pemberton who started Coca-Cola at the age of 55. Ray Kroc who started McDonalds at age 52. Craig Newmark founded CraigsList at 42, and Robert Noyce founded Intel at 41! These are just a few of society’s household names that ventured out into the unknown late in their life. So today if you are feeling overwhelmed and feel you are in a mid-life crisis in your 30s, 40s, 50s, or 60s, reflect on these individuals who achieved big things. It proves that we can accomplish anything that we set our minds to no matter the stage in life. Reflect deeply. Be comforted. Age is just a number. Be patient. Remain Calm. Plan, put your plans into action, cry privately if you must, but never, ever give up! 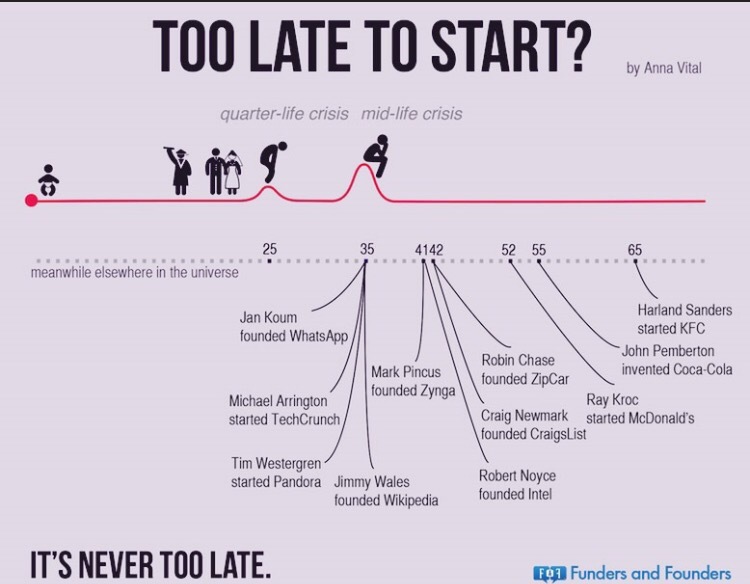 Remember…it’s never too late to start. Great advice to those looking for a Second Act. Thanks. Next Next post: Why Retreat?